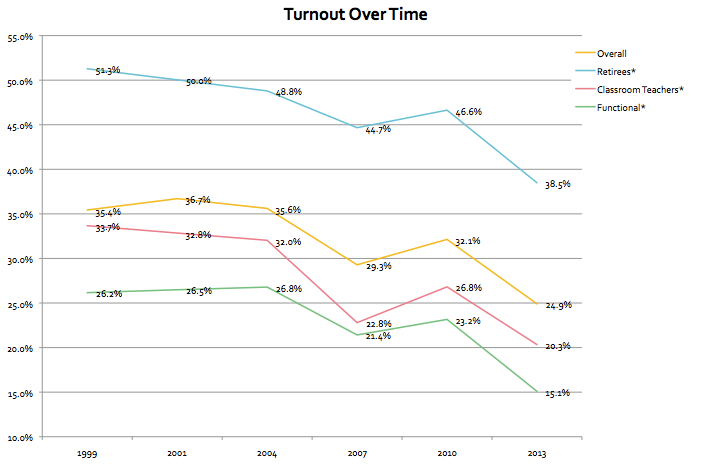 First, turnout was historically low, at 20% of the classroom membership of the union. Interestingly, retiree turnout was also down – it seems to have tracked at almost exactly 20 percent higher than classroom teacher turnout over the last 15 years. Secondly, this was the first election where retirees comprised the majority of the electorate. This is partly due to an increase in retirees as a proportion of union members, as we have lost thousands of active teachers to attrition over the last few years. However, it is mostly because retiree votes used to be capped at 18,000 but that cap has now been lifted to 23,000. However, despite these countervailing winds, the MORE caucus came out with impressive gains in every division, increasing their percent of the total vote by as much as 12% as compared with the ICE/TJC opposition caucus in the 2010 election. This means that while Unity and New Action were both losing voters as turnout declines, the number of voters for an alternative to the leadership increased, both in absolute numbers and as a proportion of the total. For a more detailed look, see these links for votal totals over time from different divisions, and vote percentages over time for different divisions. Finally, feel free to check our work and do your own analysis: the full excel spreadsheet can be accessed here. Please note that this data does not reflect final counts from non-slate votes and voided ballots; therefore, percentages may be a bit off from final calculations. We are still awaiting a full accounting from the UFT Election Committee for these numbers. *Turnout numbers for individual divisions were not available for 2001, so these numbers are an average of the 1999 and 2004 turnouts. 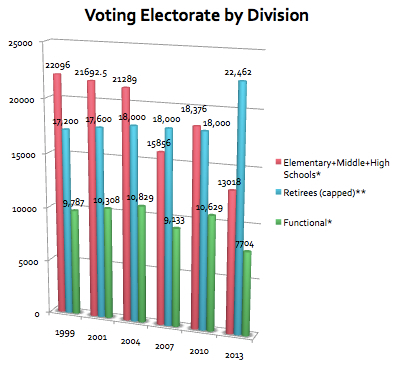 **Retiree numbers reflect the 18,000 vote cap for the 2004, and 2007, and 2010 elections. Actual retiree votes counted proportionally to reduce the total to 18,000. 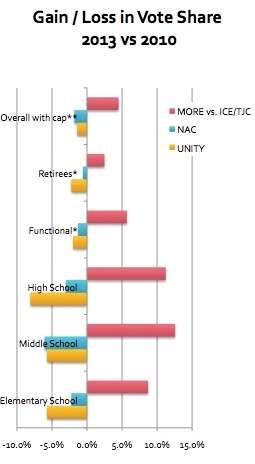 For example, in the 2010 elections, each retiree vote was worth 0.72 active member votes. Do retirees get to vote when members need to ratify a contract? Please explain this to me, the general teacher.